Beautiful out there this morning. Warmer than yesterday and breezy. As I stepped out for a walk with the pups, I noticed a faint sweetness on the wind, something blooming nearby, but what I’m unsure of. But I think it’s citrus from the yard across the street. It’s quieter this morning than it has been, just the sounds of our footsteps and the breeze in the trees. The skies are clear, more clear than they’ve been in a while, and I stop and look up at the stars. I’m not the best at reading stars, but I do recognize a few things and my eyes pick up on the Big Dipper in the west. No sign of Orion this morning, though… but it is a different time of year, and the stars change with time, much like ourselves. Quiet, quiet quiet… as we move through the neighborhood, it seems like the city has calmed down from that frantic, time-change, clock rush of just a few days ago. The city has figured out that, no, they won’t be late for work… push that snooze button. As we turn for the loop home, and we crest The Hill, I can see the Tehachapis silhouetted against the impending dawn… a long lumpy horizon against a Parrish blue sky… I just stop and stare… and there, above, like an exclamation point, is Venus… And the peak of Bear Mountain points straight up at it… I stand there, soaking it all in, relishing this moment… and I see the faintest orange creep up from the horizon… It’s so clear out, the dawn will be piercing, and sharp, and crisp, in just a little while… better bring your sunglasses. This entry was posted in Journal and tagged dogs, mornings, walk on March 12, 2014 by admin. The buzz of the city washes over me as I open the front door. The pups and I step out for our morning walk and, compared to yesterday, we’re two hours late. I don’t normally walk this late, but it is Friday, and I don’t have to teach today. Being awake for awhile in the middle of the night doesn’t help either, but that’s ok… I’m in no hurry. We step onto the street, our shadows stretching onto the pavement. Everywhere are the sounds of the morning commute, the rush to work, to school, to wherever. We walk, quietly, but for the jangle of dog hardware… clinks and chings… Bear mountain is nowhere to be seen, even though I know it’s right there. It’s shrouded in the valley haze. The sky is a pale blue, not that deep color I love, and streaked with contrails from east to west, horizon to horizon. We walk and walk. I pull the dogs close as drive-time cars pass, people on their way to eight o’clock. We turn the corner and my shadow stretches across the street to the opposite sidewalk, mirroring my each step, and each of the dogs. I hear a commotion off overhead. At the pinnacle of a pine tree to my left is a hawk, sitting on the very tip, and he’s being harassed by crows. They’re not afraid of him, they’re easily his size. But he doesn’t flinch and holds his spot looking over the neighborhood. The crows finally give up and head for another tree and I, too, forget about the hawk for now. It’s not much further on and I hear a whooosh! and the shshshsh of little wings right overhead. I glance up just in time to see a flock of little birds swirl and dive out of the way of a dark bullet. The hawk is only a blur as he dives through the clutch of birds… I can’t tell if he will be having breakfast this morning… I stand there in awe of the morning… of this sight, this small spectacle that takes place, even as the city purrs and groans and shakes on it’s way to Friday. This entry was posted in Journal and tagged dogs, morning, walking on March 7, 2014 by admin. I was up early, so I got the pups up early for our walk. Just a little after five, and we’re out the door. I’m sure the wife thinks I’m crazy, but I was awake and couldn’t sleep, and if I’m getting up the pups usually get up, too, so… out the door we go. It’s warm out this morning, warmer than it’s been. I have a long sleeve shirt on over my t-shirt, and by the end of the walk even that feels too much. I am already missing the winter. And before anyone responds with how bad a winter it’s been, I live in California and we had an exceptionally dry winter and we’re facing the worst drought on record… so, yes, I will miss winter, thank you. But there are clouds overhead… so maybe we’ll get some sprinkles? I can hope… so I do. And we walk in our neighborhood, up the hills, into the little gulleys, along the sleeping homes… and, even at this early in the morning, I see neighbors out for their morning. A lady walking here, a man on this street for his exercise… and, of course, the usual dog-suspects are all awake, warnings coming from behind fences and in dark back yards. The pups and I do our thing, still, and continue on our way. This morning little Jack is lagging a bit, so I slow my pace a little. He’s the eldest of the three. And he’s the smallest… not that you could tell by his spirit, though. Jack will try to dominate a Great Dane… I know, I’ve seen him do it at the dog park! But perhaps today he’s not quite feeling himself… Cathi and I watch for little hints as all three of our pups are older now. But he still loves these morning walks and is always eager for them. He gets so excited I can hardly keep him quiet in the mornings… On and on, we walk, we listen, we watch, we walk… Even this early, the neighborhood is awake. This entry was posted in Journal and tagged dogs, morning, walking on March 6, 2014 by admin. This entry was posted in Journal and tagged dogs, mornings, walking on March 2, 2014 by admin. A beautiful morning and a great morning for a walk with the dogs. Cool and breezy… And the skies! The clouds in the east were aflame with color from the approaching sunrise. Deep crimsons… As we walked, all I wanted to do was stop and watch… So I did. Several times. Each time I stopped and turned to the east to see how the dawn was unfolding, the colors in the clouds changing… Reds… Then orange… And then peach… And I wondered, as I walked with the pups, I wondered… Am I the only one to see this this morning? If these moments weren’t so fleeting, would I still stop for long looks? And as it passed, I wondered, over the next hill, the next mountain, is someone standing there, now, looking to the east, watching the approaching dawn, mesmerized as I was, breathing in all this glory? This entry was posted in Journal and tagged dogs, mornings, walking on February 26, 2014 by admin. We stepped out into the dark with only the morning star and the gentle light of the impending day to greet us. I could see the faintest hint of a deep red on the horizon, draped on the shoulders of Bear Mountain and the ridge line to the north. The neighborhood was already alive with the noise of Friday, an exclamation mark to the week that had come. Birds, trains, dogs, garbage trucks… everyone was awake. No sneaking quiet this morning. It’s funny to me how different each morning is around this same time. The pups and I walked along, with me looking over my shoulder to keep an eye on the dawn. More cars, a gardener and his truck, I pull the pups close and stick to the gutter as we walk the busier streets. We turn to the east, its the hill with the fire hydrant, the one that looks out across the east towards the mountains. The colors in the sky dazzle me… I stand and just look. Deep reds, oranges a hint of peach and pink… It almost hurts to look at it, to take it all in, and for that moment I feel like I am the only one in this universe, and this show in the sky, it is all just for me… As I am standing there, thinking this, looking at the spectacle of color, it subtly changes… the colors grow softer, the intensity diminishes just a little. I am awash in gratitude… That was the apex, that moment, there by the hydrant, there with the dogs oblivious to anything other than the smells on the grass, and it has just passed… The rest of the walk is literally downhill… And we turn for home, and I think of coffee, and as I walk along the final block to home, my nose catches just a hint of cooking bacon on the air… and I smile. This entry was posted in Journal and tagged dogs, morning, walk on February 14, 2014 by admin. This entry was posted in Journal and tagged dogs, grateful, mornings, walking on January 18, 2014 by admin. I’m up early this morning. Excited about being back in school, about seeing the new kids, about teaching. I’m up early enough that I had to wake the pups from their slumber to walk the neighborhood. First, Sophie asleep on the couch. 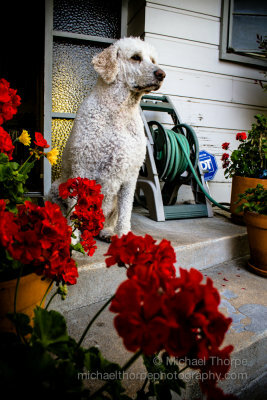 Then Teddy, always vigilant when walks are concerned and eager to go once he realized. Then I had to roust old Jack, sleeping deeply, but once he saw what was going on, he was ready, too. Up before the dawn, all of us out the door. It’s cold, but not as cold as it has been, as it could be. Up and out before the dawn, so there’s no sunrise to report about. We walked and walked and it was silent but for one rooster some streets over. We walked before the sun, we walked before the birds awoke, we walked before the garbage trucks, we walked before the day began. We walked for me, for the pups, for you. We walked for the quiet city still asleep… We walked for the stars above, circling endlessly. We walked to call the sun forth to light our way and to warm our day. We walked and walked, quietly here, but for the jingle of tags and the squeak of one man’s old shoe. We walked for the day, to call forth from the dark. We walked. We walked. This entry was posted in Journal and tagged dawn, dogs, walk on January 7, 2014 by admin. This entry was posted in PAD and tagged dogs, Teddy on April 20, 2013 by admin. We took a couple days off and headed for the beach. Really, it was a short vacation for us compared to how long we usually stay, but we weren’t going for ourselves. The trip was really to take the dogs for some sand and surf. Though Jack and Sophie have been before, this was a first time for Teddy. For fun, Cathi’s mom came along with her little dog Mo. On Thursday we spent the better part of the afternoon letting the pack run loose on the beach. All the dogs ran until exhausted, after which we checked into our rooms, cleaned everyone up and had a short nap. Friday morning we walked to breakfast on the patio at the Sea Shanty. The staff was fawning over the pups and being rather free with the dog biscuits. I was pleasantly surprised at how well behaved the dogs were considering this was their first visit to a restaurant. We spent the rest of the morning on the beach before checking out of our room and heading home. 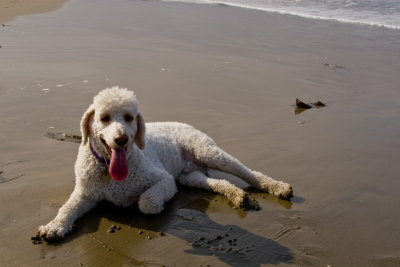 This entry was posted in Journal, PAD, Photo and tagged beach, Cayucos, dogs, Teddy on September 13, 2008 by admin.